(Phys.org)—New research by Stanford aeronautics and astronautics Assistant Professor Sigrid Close suggests she's on track to solve a mystery that has long bedeviled space exploration: Why do satellites fail? In the popular imagination, satellites are imperiled by impacts from "space junk" – particles of man-made debris the size of a pea (or greater) that litter the Earth's upper atmosphere – or by large meteoroids like the one that recently exploded spectacularly over Chelyabinsk, Russia. Although such impacts are a serious concern, most satellites that have died in space haven't been knocked out by them. Something else has killed them. The likely culprit, it turns out, is material so tiny its nickname is "space dust." "Spacecraft transmit a radio signal, so they can receive one that might potentially disable them," Close said. "So our question was: Do these plasmas emit radio signals, and if so, at what frequencies and with what power?" Now, through experiments she's led at the Max Planck Institute for Nuclear Physics in Germany, Close has proof that particles that mimic space dust can indeed cause trouble. The researchers fired tiny dust particles at targets resembling satellites at speeds of 60 kilometers per second. "We found that when these particles hit, they create a plasma or quasi-neutral gas of ions and electrons, and that plasma can then emit in the radio frequency range," Close said. These plasma-induced bursts of energy could explain mysteries like the European Space Agency's loss of its Olympus communication satellite in 1993, Close believes. "Olympus failed during the peak of a meteor shower, but they never detected a momentum transfer, which means whatever hit it wasn't big enough to be detected mechanically," she said. "And yet this multimillion-dollar spacecraft was effectively taken out." Many other satellites have also failed electronically rather than mechanically. If Close is right, her experiments point to design modifications that might lessen the damage that space dust inflicts. How the satellite is oriented in space, whether it is being heated or cooled at the time and whether it is positively or negatively charged, all appear to make a difference to whether a plasma-induced radio signal actually causes damage. "Spacecraft are being hit all the time by these particles," said Close. "So we feel like we found a smoking gun here in the sense of explaining why this doesn't always happen. And once we know what's going on, there are solutions we could implement to save billions and billions of dollars." Her next step will be to show that these effects occur in space as well as in the laboratory. To that end, Close is working with James Smith and Henry Garrett of NASA's Jet Propulsion Laboratory to design an experiment that could be anchored to the International Space Station. "The idea is to try and get hit as much as possible!" Close joked. Close's interest in astronautics began with a childhood love of shooting stars. By the time she was born, however, these weren't just objects of wonder. "Larger meteoroids look remarkably like missiles when they come into the atmosphere," she said. "That's why scientists started looking at them more carefully back in the 1960s, because it was hard to tell the difference between a big rock entering our atmosphere versus someone trying to shoot us." Space agencies' focus has since switched to the threat posed by meteoroids themselves. A second research project of Close's, for which she's received a National Science Foundation (NSF) CAREER Award for outstanding young teacher-scholars, uses ground-based radar to spot meteoroid-created atmospheric plasmas. By mapping the location, size and density of these plasmas, she's able to deduce the size and locations of the particles causing them – and thus better understand the scope of what's hitting Earth, how fast it's coming at us and where in the universe it actually originates. 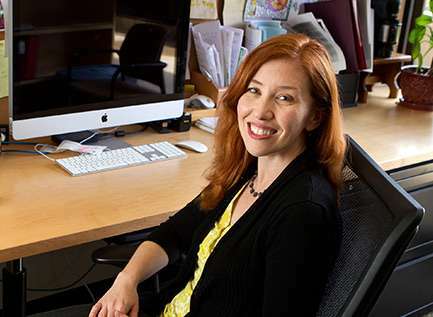 In a related investigation, Close and three colleagues in her department are working on an international research effort to model how space debris of all kinds gets produced and then changes over time. The project is funded by the Center of Excellence for Commercial Space Transportation at the U.S. Federal Aviation Administration, which, as space flight becomes more commercialized, could take on a responsibility for safety similar to the one it holds for regular commercial flight today. Close has also received NSF and U.S. Navy funding to research the connection between meteoroids, plasma and lightning to understand how meteoroids and other phenomena that create atmospheric plasmas might cause interruptions to satellite communications, and then to help ameliorate these interruptions. Another, newer project tackles the problem of the communications blackouts that bedevil spacecraft when they re-enter the Earth's atmosphere at hypersonic speeds. Beyond her research around meteoroids, Close is the Americas leader of QB50 a multi-national project to build a network of 50 small satellites to better understand the ionosphere, which lies some 300 kilometers above Earth's surface. Separately, she's exploring how to make electric plasma propulsion rockets more efficient for space travel. Her lab is also researching black box technology for spacecraft. "We don't have an all-inclusive set of sensors on spacecraft that looks at everything that the space environment can do to them," she said. She hopes the data from those boxes could be used to avoid these problems. "If we're going to eventually send people to Mars, we need to learn about these phenomena, and no one has really been looking at them comprehensively until now." Close herself once dreamed of being an astronaut. Now the mother of two young girls, she is not so eager to fly into space. But she remains passionate about sharing her enthusiasm for space science at the university level and beyond. To that end, Close regularly helps out with NASA outreach events and was one of the four main hosts for National Geographic's Known Universe TV series. Next up, she's slated to host a multi-part series produced by Worldview Pictures about unresolved mysteries in astronomy and astronautics. The working title suits a researcher dedicated to solving the astronautic mysteries that nature throws at us – Sigrid Close: Space Investigator. It's about time NASA has decided to research that which consists of over 99% of the universe. The EMP effect experienced in Russia goes further in supporting the EUT POV that that this charged bolide exploded due to electrical forces in addition to the kinetic and chemical forces. When these forces are properly considered, the conclusion that the bolide was much smaller than the 10,000 metric tons will be reached. Re: "These plasma-induced bursts of energy could explain mysteries like the European Space Agency's loss of its Olympus communication satellite in 1993, Close believes ... "Olympus failed during the peak of a meteor shower, but they never detected a momentum transfer, which means whatever hit it wasn't big enough to be detected mechanically," she said. "And yet this multimillion-dollar spacecraft was effectively taken out." ... Many other satellites have also failed electronically rather than mechanically." I don't really get the problem here. It's not like it's amateur hour for electricity and magnetism for humans. All that has to be done is to ignore all of the pseudoskeptics (and even the astrophysicists!) falsely claiming that quasi-neutrality means that space is electrically sterile (as in condensed matter) and run some extra tests which presume that these satellites are occasionally bombarded by electrical currents. For the record -- once again, folks -- quasi-neutrality in a plasma means that there are equal numbers of positive and negative carriers in a plasma. But, unlike condensed matter, the plasma still conducts, because conductivity is a function of CHARGE MOBILITY. And if all of the pseudoskeptics out there would just engage the subject of what a plasma actually is, they'd quickly realize that -- unlike condensed matter -- those charged particles are not constrained by some physical box which forces them to charge-neutralize. Quasi-neutrality does not imply no electrical currents, and nobody can simply presume that the universe started in some sort of charge-neutral state. And yet more, nobody should imagine that we can simply rule out these currents simply by asking where they come from. That's called getting ahead of yourself. As in other scientific endeavors, our first job is to simply try to characterize the phenomenon. A massive electrical discharge should have created the biggest lightning stroke ever recorded between the explosion site and the ground, or back out towards the ionosphere, likely along the incoming trajectory. Video shows that didn't happen. Once again Candrive85 is plugging his asshat theory without bothering to check whether the available evidence supports him or not, and Hannes is there to back him up with more drivel. The Space simulator, a.k.a. some glorified "wind tunnel" for subluminal spaceships, is not doable. The only way to know what happens to the hull of a super fast star ship is to build a scaled down experimental prototype and have it return to us so that we can study it. We have to consider the fact that it might be impossible to communicate to colonists traveling to another star. On the other hand, there is a bow wave, therefore a still area looking back from the middle of it, from where it might be possible to communicate information. So install a deflector array. Easy fix. Should have? Could have, definitely, but should have? Some of the available evidence shown in the video on the linked article shows this meteor shining so brightly is casting shadows WHERE THE SUN IS SHINING. And it's not a sudden flash, but it shines brightly as it is moving across the sky. Have you ever done any welding? The arc created by a welder looks very similar to the shadows cast by the meteor. Why are you so focused on the shadows? There's direct photos and video of the explosion itself, and there's no cosmic lightning bolt emanating from it. Seeing as the explosion occurred over a populated area, and an Earth-directed bolt would likely go straight down, it would have been noticed. A current directed back towards the ionosphere wasn't seen either, nor does it make sense, because why would this object have been able to pass through the ionosphere in the first place without instantly discharging? So there you have it - a major current towards either of the two relevant conducting layers has been ruled out. This leaves one other possibility, which is that the pent-up energy of the charges was somehow confined together safely until some aspect of atmospheric released it and the object exploded, with the residual charge expanding outward in all directions, not channeling itself towards one conductive layer or another. This second possibility is pure stupidity. This object must have had countless high speed collisions with other objects (and if we are to believe you, highly charged objects - those with an opposite polarity would have made for a particularly high energy encounter) during the millions of years it's been floating around. These collisions would surely would have triggered the explosive detonation of this object already were it capable of such a thing. Plus there's the asinine assertion that this object could retain a charge like this for millions of years even though it is surrounded by solar wind. As you conveniently like to forget, the solar wind is composed of both electrons and positive nuclei moving in the same direction. If our object was positively charged (as an example), its electric field would drive away the positively charged nuclei and attract electrons fiercely. These would start to cancel the positive charge, until it was weak enough to reach an equilibrium. Clearly there was an arc event, just because you insist there has to be a giant lightning bolt (fallacy) doesn't change such. It is charged because it is immersed in the charged solar plasma. The solar plasma is NOT homogeneous, therefore as this rock travels through the plasma it will inherit a charge that would be different than the Earth (for various reason). As HA said, quasi-neutral doesn't equate to electrically neutral. Your preconceived notions of how these interactions must occur are flawed and simplistic. Electrodynamic interactions are far more complex than you presume. Brakan's solution about it exploding as it reached the unknown atmospheric trigger released the energy. Makes sense. Agrees with what we know. What gets stronger as you get closer to Earth's surface? Gravity. Translation: Cantdrive85 can't come up with a model that works. Once again, I don't need to reinvent the wheel, the EUT has a POV that works quite well in describing what we see. I know you will ignore the article, I can tell by your continued erroneous assumptions that you have not educated yourself on the theory. Yet, in your ignorance you still "know" how these events should unfold, albeit in your OWN mind. Here is an image of the lightning bolt you missed, seems as though the bright flash obscured it, but it's there. It's pretty big too. The meteor came from the East at dawn - http://en.wikiped...d_en.png - and naturally you cherry-picked a still from a dash cam that was pointing East. 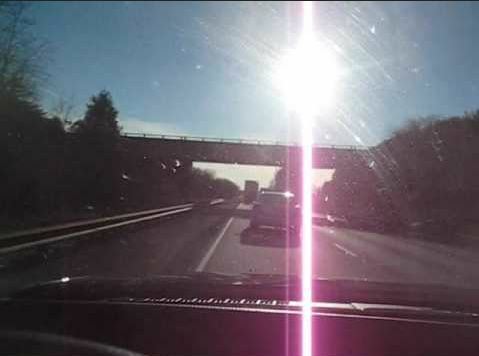 What you are actually seeing is the overlapping of the light patterns from the sun just below the sun combining and the meteorite explosion above, augmented by the fact that car windshields are sheets of glass with a cylindrical curvature, cylinder axis almost vertical. 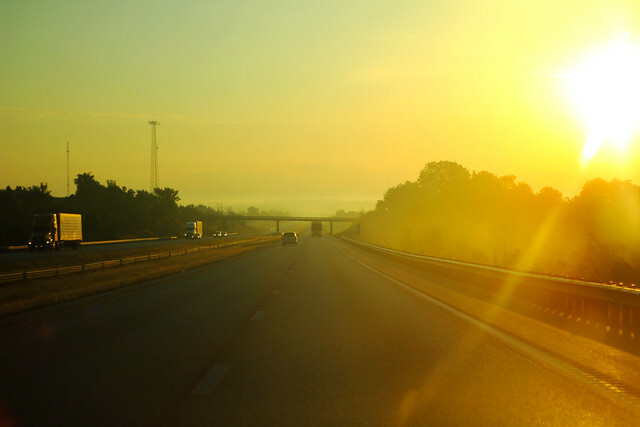 This causes bright objects like the sun viewed through a windshield to exhibit bright vertical artifacts. Everybody has seen this effect, http://4.bp.blogspot.com/_pWXqYsUUOg4/S1Sx3cKUXNI/AAAAAAAAAGo/gYvY1ON1NOk/s640/IMG_0226.jpg , so it's just awful that you're trying to convince us it's something else. I suppose you see Jesus in your toast too. Strange then that the phenomenon was documented from multiple vantage points, with the same morphology. More coincidence? My link didn't render well, so here's some more. Your second link refers to a video containing shots from multiple angles, but only mentions a possible connection in one of them, between the :45 and :50 marks - an eastward pointing windshield shot. The second video is over 8 minutes long, but they note possible connections in just one 11 second segment - in video of such horrible quality it appears to be ~ 72 x 72 resolution. In this image the sky below the explosion lights up because the horizon was the brightest part of the image beforehand, and was already close to saturation (the camera was pointed down at a dark parking lot, also pointed northeast so suffered from some of the same problems as other east-pointing cameras). Then of course there's video number three, which is the classic East-pointing windshield view exhibiting the optical tricks I mentioned before, and which isn't even worth discussing further. Are you done cherry-picking, and when will you realize your cherries are rotten? The only thing that impedes any scientific exploration is funding. It's about time NASA has decided to research that which consists of over 99% of the universe. All the space dust in the galaxy combined would have a mass the size of 1/4th that of Mars. That's way less than 1% of our galaxy. Combine all the galaxies and I'm sure each star or black hole in a galaxy or local group is far more than 99% more massive than the proximate space dust. I finally see what cantdrive85 is saying. If you stare at the pictures he has linked to you can clearly see Thor's hammer Mjolnir spitting lightning. By the beard of the FSM, I too have seen the light!!! (of course cantdrive85 has probably eating too many magic mushrooms).